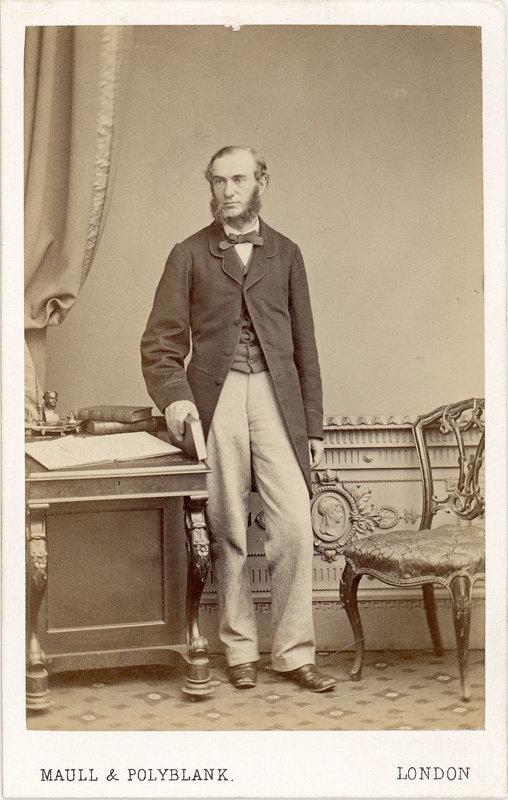 Balfour Stewart (1828-1887) was born in Edinburgh but his father was a younger son of the Stewarts of Brugh in Westray and his mother was a daughter of William Clouston, minister of Stromness and Sandwick. Stewart spent two years at the University of Edinburgh, then left without completing his degree and was apprenticed to his cousin James Balfour, a merchant in Leith. After seven years there he went to Australia with James but returned just eighteen months later. His old professor at Edinburgh, James David Forbes, helped him find work as an assistant observer at the Kew Observatory in February 1856. He was back at Edinburgh University by October and graduated in April 1857. Stewart then became an assistant to Forbes, lecturing on mathematics and mechanics and joining him in his study of heat. He made the important discovery that radiation isn’t just a surface phenomenon but passes through the interior of the radiating body. He also established that an object must absorb and radiate energy of the same wavelength. This was important in the development of spectrum analysis. However, after just two years Balfour Stewart was back at Kew, this time as its Director. Kew Observatory had been built to allow George III to observe the transit of Venus in 1769 and was then leased to the British Association for the Advancement of Science, to be used in the study of the physical sciences. When Stewart left after his first brief employment, the Committee had minuted their regret at his departure and he had maintained a connection with Kew. According to Katherine Anderson in Predicting the Weather: Victorians and the Science of Meteorology, he had worked on a survey of terrestrial magnetism with the director, John Welsh, whose death led to Balfour Stewart’s appointment. The Observatory housed a magnetograph that kept a continuous record of the Earth’s magnetic fields and a heliograph with which to study the sun. Stewart’s arrival at Kew was greeted by the most powerful solar storm ever recorded. His study of the storm led him to suggest a connection between solar behaviour and terrestrial phenomena. Stewart published the first paper to suggest the presence of an electrified atmospheric layer. This was later named the ionosphere by Robert Watson Watt, the ‘father of radar’ (who had been taught physics at Dundee University by Professor William Peddie, son of the Free Church minister in Papa Westray). In the second half of the 19th century, the need for accurate scientific instruments increased rapidly. More and more scientists and explorers needed reliable instruments if their work was to have any value. Stewart led Kew to become the national centre for the standardisation of thermometers, sextants and other meteorological instruments. In 1862 Stewart was made a member of the Royal Society. Supporters of his proposed membership included J.D. Forbes, Richard Carrington and Admiral Fitzroy, ex-captain of the Beagle but one name stands out from all the rest, Michael Faraday. Six years later, he was awarded the Society’s Rumford Medal, awarded for outstandingly important discoveries in the field of thermal or optical properties, for his discoveries in the radiation of heat. Other recipients of the medal include Michael Faraday, James Clerk Maxwell, Ernest Rutherford and Frank Whittle. In January 1867 Stewart was appointed secretary to the newly formed government Meteorological Committee, set up to oversee the operation of the Meteorological Department (later the Met Office). One of the first actions of the Committee was to set up a network of autographic (producing continuous traces of the meteorological elements) weather stations around the UK. Kew Observatory was the lead station and for more than two years Stewart supervised the installation of meteorological stations all over the country. He resigned from the committee in 1869 and left Kew the following year. Balfour Stewart was appointed head of the Physics Department of Owens College, Manchester in 1870. Under his direction the department became one of the first in the country to teach its students how to conduct experiments and it developed into the world-class facility it was to remain. He also played an important role in the college’s development into the University of Manchester. His successors in the department include Ernest Rutherford and Brian Cox. The universities of the time were slow to recognise the importance of the teaching of experimental science. When it was proposed to establish laboratories at Cambridge, Isaac Todhunter objected that it was unnecessary for students to see experiments performed, since the results could be vouched for by their teachers, all of them of the highest character, and many of them clergymen of the Church of England. In the long run, Stewart’s teaching methods were vindicated in the most spectacular way possible: two of his students won the Nobel Prize for physics. Sir Joseph John Thomson, known as J.J. Thomson, was awarded his prize in 1906, for the discovery of the electron and investigations on the conduction of electricity by gases. J.J. Thomson came to Owens College in 1870 – the same year as Balfour Stewart – when he was just fourteen. Six years later he went to Cambridge and stayed there, becoming Cavendish Professor of Physics. He was in his turn a gifted teacher: seven of his research students and his son won Nobel Prizes, so it could be said that Stewart’s influence spread far and wide. Charles Thomson Rees Wilson was awarded his Nobel Prize in 1927, for the invention of the cloud chamber, which can detect subatomic particles. He went to Owens College in 1884, aiming to become a doctor, and Stewart is credited with playing a large part in leading him into physics and meteorology instead. Balfour Stewart was an active member of the British Association of the Advancement of Science and in 1875 he was President of the Mathematical and Physical Science Section. His presidential address, which can be read online, was largely concerned with solar research and the sun’s effect on the earth. He concluded his address by predicting that a great generalisation was looming, a mighty law that would involve facts hitherto inexplicable. The Association formed committees to investigate various scientific subjects and Balfour Stewart’s name appears in exalted company. His interest in energy and heat was shared by men who have come to be regarded as some of the greatest scientists in history. In 1869 Stewart was appointed to a five-man committee to investigate the mechanical equivalence of heat. The other members were Peter Guthrie Tait, professor of natural philosophy at Edinburgh; James Prescott Joule; James Clerk Maxwell; and William Thomson, the future Lord Kelvin. Stewart wrote the physics primer, and his book for adults, Lessons in Elementary Physics, had been published in 1870. He wrote the article on Terrestrial Magnetism for the ninth edition of the Encyclopaedia Britannica and many scientific papers, but his most widely read book was something entirely different. Co-written with Peter Guthrie Tait in 1873, The Unseen Universe attempted to reconcile science and religion. They wrote: “We attempt to show that we are absolutely driven by scientific principles to acknowledge the existence of an Unseen Universe, and by scientific analogy to conclude that it is full of life and intelligence – that it is in fact a spiritual universe and not a dead one.” The book was very popular and went into twelve editions. It would be very interesting to know what role, if any, Balfour Stewart’s uncle Rev. Charles Clouston played in his early career as a meteorologist. Born in 1800, Charles succeeded his father William as minister of Stromness and Sandwick but was perhaps more interested in the scientific than the spiritual. He founded the Orkney Natural History Society which still runs the Stromness Museum and he wrote a guidebook to Orkney that includes a list of 156 plants previously unknown in Orkney. His great interest, however, was meteorology and he wrote a book about the scientific basis for Scottish weather sayings. Another of these Clouston uncles played a role at the end of Balfour Stewart’s life. Robert Clouston made a fortune in West Africa and really enjoyed spending it. He collected art, travelled Europe and bought land in Orkney and an estate in Ireland: Ballymagarvey in County Meath. This estate north of Dublin is now one of Ireland’s most exclusive wedding venues. Balfour Stewart inherited the estate in 1882 and died there at Christmas 1887, aged just fifty-nine.